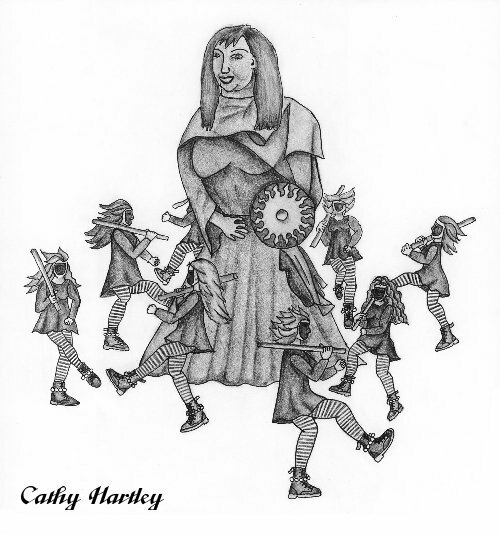 Border morris dancing was at its height in the 1850's - 1860's and was always performed by men. Each village had its own style of dancing and costume, and dances were developed which were exclusive to a particular village. Border dancers often would black their faces with burnt cork to disguise their identity if they were busking, which was tantamount to begging in the nineteenth century. The dancers were sometimes referred to as 'Not For Joers' and the dancing as 'Not For Joeing' after the popular border dance and tune 'Not For Joe'. 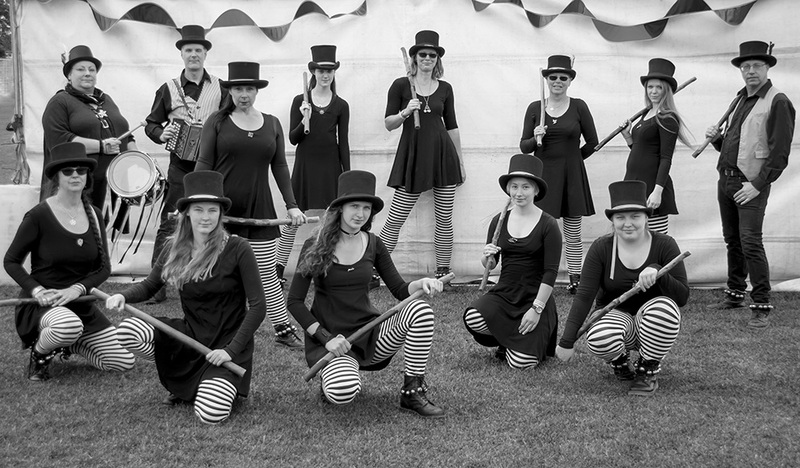 Hot For Joe is an Adelaide-based women's border morris team formed in 1993 by Mary McFadden. The team has developed a highly styled, truly unique form of morris dancing, which essentially emphasises the importance of precise and energetic dancing while at the same time presenting a mysterious, wild and dramatic performance. In both 1995 and 1997, the group was the recipient of a South Australian Folk Federation Award, and were also nominees for a SAMIA (South Australian Music Industry Association) award in both of these years. These accolades have reflected not only the group's growing popularity, but also a renewed respect for this ancient art form. All of the dance repertoire has been choreographed within the team and some of the tunes used are also originals. When performing in public, Hot For Joe wear a 'kit' which consists of black tunic dresses, black and white striped leggings and black 'Doc Marten' type boots. Bells are worn on the feet, and faces are painted black in a mask-like appearance, just as those of our border-dancing ancestors were. During the warmer months, a more appropriate version of the kit is worn - featuring less layers and more skin! Hot For Joe is an inspiring modern interpretation of an ancient dance tradition. If you are interested in joining the side, now is the PERFECT TIME! Our Contact Details are below, please feel free to get in touch. The English Ale last happened on 19th May 2018 at Mylor Hall and Oval; a wonderful event and probably the biggest yet! The event will return, bigger and better, on 4th May 2019! Paul plays diatonic button accordions made by Peter Hyde. Web site and all contents Â© Copyright Hot For Joe 2019, All rights reserved.